Microsoft finally made a real laptop, and it’s beautiful. I got a chance to get a closer look at the new Surface Laptop during Microsoft’s event in New York City, and I’m impressed. This could be the laptop I’ve been waiting for Microsoft to create. The Surface Book was always a little too top-heavy and chunky, but this new Surface Laptop is under three pounds and feels high end, thanks to its aluminum finish and design. Microsoft has made some interesting hardware choices here, and they genuinely add up to an impressive Windows laptop at first glance. 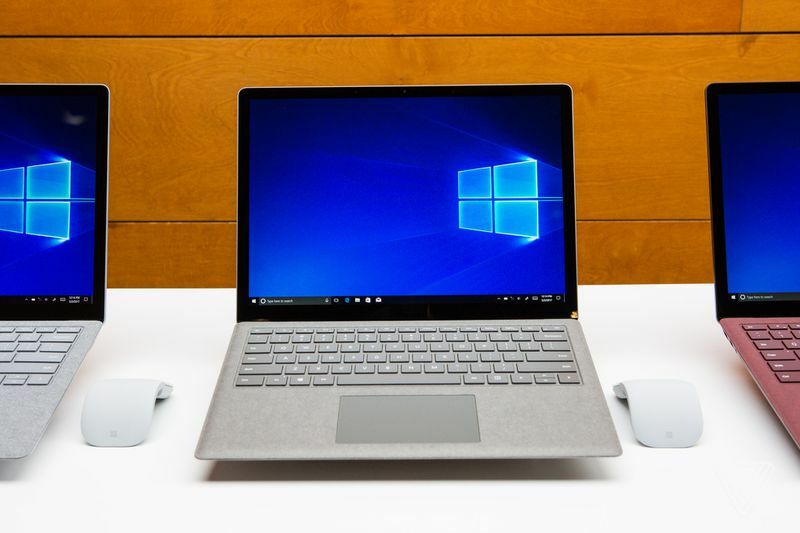 Inside the Surface Laptop on the base model, which will debut on June 15th priced at $999, is Intel’s latest Core i5 processor, 4GB of RAM, and 128GB SSD. Microsoft is using a 13.5-inch PixelSense display, running at a 2256 x 1504 resolution, along with support for the Surface Pen and touch. It’s a 3:2 aspect ratio, so it looks just like a Surface Pro 4 or Surface Book display. I noticed there’s still a little bit of screen wobble when you touch the display, like most Windows laptops, but the hinge and body of the laptop feel study otherwise. 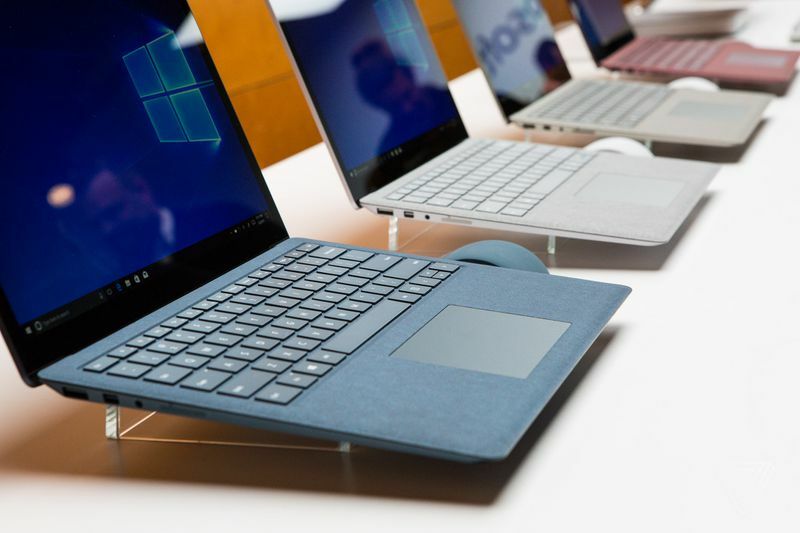 Microsoft has made the Surface Laptop display look like it’s glued directly to the keyboard without a hinge, thanks to a repositioning of the Wi-Fi and Bluetooth antennas. That repositioning creates the only ugly part of the Surface Laptop design in my opinion. There are antenna lines on each side of the Surface Laptop, just like you’d find on smartphones like the iPhone 7. On the right-hand side there’s a Surface connector for power and connections to docks, and on the left there’s a regular USB port, a mini DisplayPort, and a headphone jack. Unfortunately, Microsoft hasn’t added USB-C here, and that’s disappointing given that the majority of high-end laptops are shipping with at least one USB-C port. Microsoft is claiming battery life will be 14.5 hours on the Windows 10 S, and that you’ll be able to put the device to sleep and resume it days later without any loss of battery. Windows 10 S is the operating system that powers the Surface Laptop, and it’s designed to only run apps from the Windows Store, which means traditional desktop apps will need to be specially packaged to work with the Surface Laptop. If you want to use Chrome, you’ll have to wait for Google to list it in the Windows Store, or pay $49 to upgrade to Windows 10 Pro and unlock every desktop app. An extra $49 for the functionality you’d expect from a Windows laptop seems like a bad idea from Microsoft. Fortunately, Microsoft is allowing potential Surface Laptop owners to avoid the fee until the end of the year, and throwing Office 365 Personal in for free so it should be a non-issue for early adopters, at least. Operating system aside, I love the design of this Surface Laptop. I rarely get impressed by Windows laptops, unless they do something truly unique. Microsoft hasn’t done anything unique here to change the idea of a laptop, but it’s clear the company has focused on what actually matters. The keyboard and trackpad feel great, the display looks crisp, and it’s all packaged into a design that looks and feels beautiful. I’m excited to review the Surface Laptop, and if Microsoft’s battery life claims are accurate then this could be the Windows laptop I’ve been waiting for.